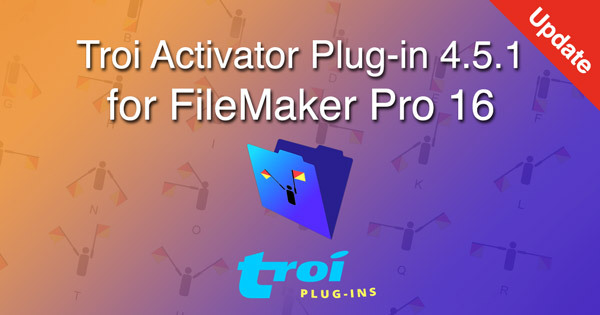 Alphen aan den Rijn, the Netherlands, December 11, 2017–Troi today announced the immediate availability of Troi Activator Plug-in 4.5.1 for FileMaker Pro 16. What is new in version 4.5.1? A fully functional demo version of Troi Activator Plug-in 4.5.1 is available on the Activator Plug-in page. Licenses cost US$ 89 per user. Details on developer licenses and multi-user discounts can be found on the Activator Plug-in page. You can order licenses from our shop. The 4.5.1 version works with the 4.5 version of the registration. If you bought a license for a pre-4.5 version on or after June 14, 2016 the upgrade is FREE! Eligible users have been sent a new registration string in September 2017. Upgrades from licenses bought before June 14, 2016 are available from US$ 39 per user. Upgrade prices for other licenses can be found in the shop. You can order upgrades there. End of year sale: all licenses 10% off! The coupon code is valid until December 31, 2017.